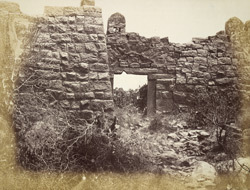 Photograph of a masonry wall in the Fort at Kondapalle, in Andhra Pradesh, from the Archaeological Survey of India Collections, c.1880s. In the Madras List of 1882, Robert Sewell wrote about Kondapalle, "A fine hill-fortress very picturesquely situated amongst hills and forest. It is said to have been originally built by the Reddis...It probably dates from about the fourteenth century when the Reddis were in power. It was attacked by the Mussulmans and finally passed into their possession about the year 1471. There is a fort and a handsome palace on the top of the hill...there are lines of strong fortifications and a number of bastions on points commanding the plains...There are several buildings still standing beside the palace which is ruins."